From freight forwarders with decades of experience to start-ups who specialise in a particular area, there’s no shortage of freight forwarders to choose between. But being spoilt for choice can make the decision of who to trust your cargo to more difficult. At John Good Shipping we’re proud to offer a completely transparent service, so you can be sure that your shipments are in the right hands. 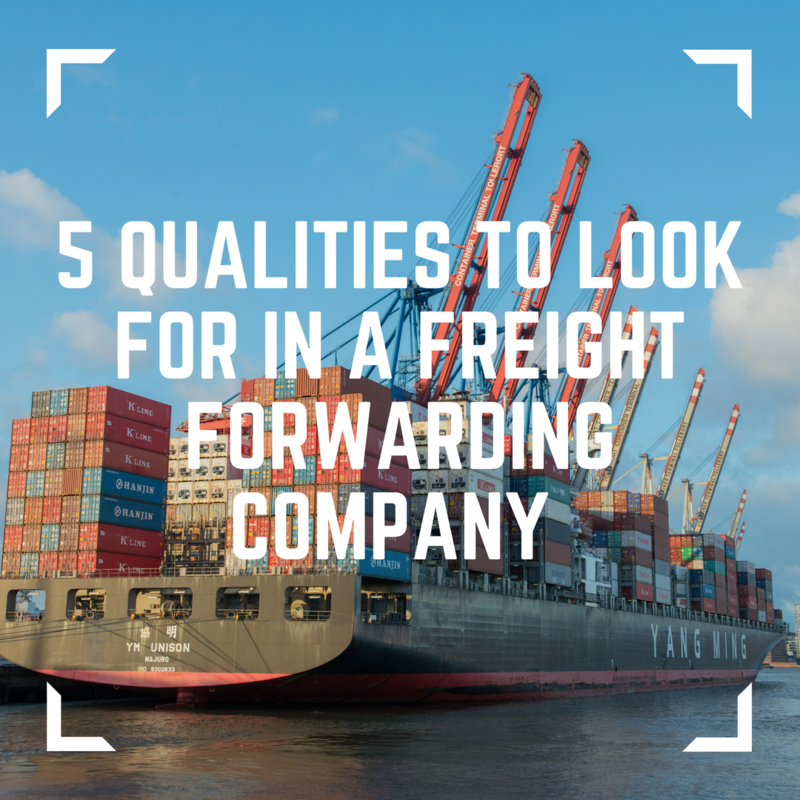 Here we share the five qualities that we think you should look for when selecting a freight forwarder. The freight forwarding industry in the UK is unregulated, which means that – in theory – anyone can set themselves up as a freight forwarder. Choosing a freight forwarder with many years of experience under its belt will give you the peace of mind that they know what they are doing and are used to dealing with any issues that could crop up during a process that can be quite complicated. However, there are many variables when it comes to freight forwarding, so it’s also essential to ensure that your chosen freight forwarder has experience that applies to the service that you need. For example, if you want to send cargo quickly by air, a freight forwarder that mainly deals with shipping by sea may not be the right one for you. This is even more crucial if you’re sending a type of cargo that requires specialised handling – perishables that need to be temperature controlled or vehicles that require Roll-on, Roll-off transportation, for example. John Good has over 180 years of experience in shipping, with teams of specialists in place to deal with clients in the automotive, food and drink, eCommerce, retail, furniture and packaging industries – so we’re confident that we can deal with shipments of any kind. In place of proper regulation, accreditations can serve as a good indicator of high standards and professionalism, so look at the ‘stamps of approval’ that your freight forwarder holds. At John Good Shipping we’re accredited by the British International Freight Association (BIFA), the Institute of Chartered Shipbrokers, the Road Haulage Association (RHA), and the United Kingdom Warehousing Association (UKWA). We’re also a licensed International Air Transport Association (IATA) cargo agent and an Authorised Economic Operator (AEO), so your goods should be able to take a speedier route through the UK Customs process. Look out for these accreditations when you create a shortlist of freight forwarders to meet with. A freight forwarder relies on its network of carriers and agents to be able to carry out the best possible service. If that network is lacking, this could mean delays to a shipment or issues that aren’t easily resolved. For example, a freight forwarder with multiple carriers to choose between will be able to select the best option to suit your shipment. And agents in your cargo’s destination country will be on hand to deal with any problems at customs or with the shipment’s onward journey. The key is to check your chosen freight forwarder’s network in the countries that you’ll be importing from or exporting to, to ensure the smoothest service. With a presence in 42 countries, we feel that John Good Shipping is ideally placed to facilitate most shipments. Obviously, the right freight forwarder for you will be one offering the specific shipping service that you require – whether that’s Full Container Load (FCL), Less than Container Load (LCL), Roll-on, Roll-off (RORO) or something more specialised. However, there’s a whole host of wrap-around services that a freight forwarder might offer, which could make your business run much smoother and make your life much easier. As well as taking care of all the relevant documentation and helping to facilitate fast-track customs clearance, John Good Shipping offers a full range of optional extras, from product sourcing and packaging to storage and distribution. We also provide port-centric logistics, which can reduce the number of handling stages involved in warehousing and distribution. This has numerous potential benefits including saving you both time and money, reducing the carbon footprint of your cargo and also minimising the risk of issues including delay, loss of cargo or mishandling. A good company is built on excellent customer care. If something goes wrong somewhere along the shipping process – which can happen, no matter which freight forwarder you use – having someone dedicated to putting it right as quickly as possible is invaluable. You should also look for specific tools that will make your experience as a customer easier. Online tracking, for example, is a fantastic tool that allows greater communication between businesses and their own customers. As a family-owned company formed in 1833, John Good Shipping prides itself on its customer care. One of our five fundamental company values is to provide a service we are proud of, and this has been recognised with the numerous accreditations and awards that we hold.